The embedded flash drive is no different in volume than existing 64-layer solutions for compatibility with a wide range of other consumer devices. Storage capacities begin at 32 GB and top out at 256 GB for high-end smartphone SKUs. 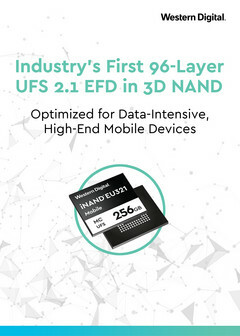 Western Digital is now mass producing its first 96-layer 3D NAND flash storage for major OEMs to be used on smartphones, tablets, mobile PCs, and other devices. Called the iNAND MC EU321, the module promises very fast sequential read and write rates of 800 MB/s and 550 MB/s, respectively, and a storage capacity of up to 256 GB. In comparison, the 128 GB UFS 2.1 flash in the Galaxy Note 9 returns sequential read and write rates of about 800 MB/s and 200 MB/s, respectively, according to our own tests on AndroBench. Memory competitors like Samsung and Micron have also been investing in 96-layer 3D NAND throughout the year with differing fabrication methods to achieve similar goals. Additionally, Western Digital is promising improved performance sustainability when the drive begins to reach full capacity via a small update to its proprietary 5th generation SmartSLC technology (SmartSLC 5.1). The iNAND MC EU321 supplants last year's 64-layer iNAND MC EU311. It is unknown when we may begin seeing consumer devices sporting the new MC EU321. Since the embedded chip can start as low as 32 GB, its applications can range from cheap tablets like the Nintendo Switch up to high-end next generation smartphones from Apple. 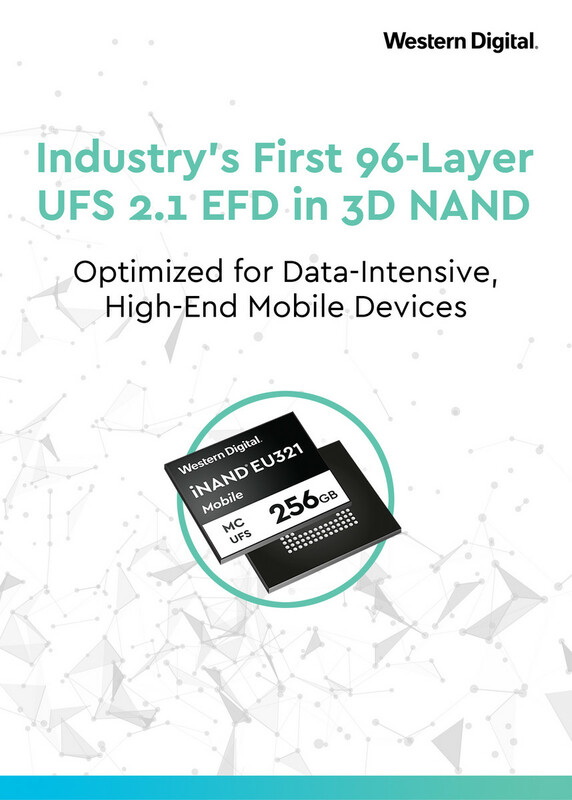 Western Digital Corp. (NASDAQ: WDC) today introduced the industry’s first 96-layer 3D NAND UFS 2.1 embedded flash drive (EFD), the Western Digital iNAND® MC EU321, accelerating the possibilities of artificial intelligence (AI), augmented reality (AR), multi-camera high-resolution photography, 4K video capture and other demanding applications for high-end mobile and compute devices. All these data-intensive applications require greater capacities and speeds to deliver the seamless on-the-go experience that consumers have come to expect from their mobile devices. In the first half of calendar year 2018 total smartphone shipments had 40 percent more embedded storage capacity than shipments in the first half of calendar year 2017. The equivalent to 51GB per smartphone , creating increased demand for higher capacities and smarter storage technologies.